Dr. Ashton Staunton was born and raised in Mount Carbon, WV. She graduated West Virginia University Institute of Technology in 2010 with a Bachelor of Science in Biology and a minor in psychology. Due to her love of helping others, she then decided to continue her education at the West Virginia University School of Dentistry. Graduating with her Doctorate of Dental Surgery in May of 2014, she was excited to begin her dental practice with a West Virginia health clinic, Valley Health, where she could better help underserved dental areas of our state. 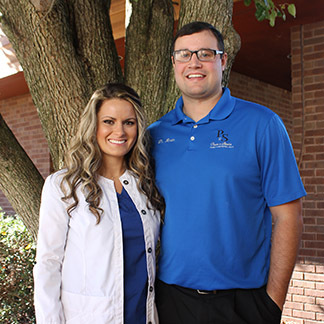 After two years of practice, she decided to take on her own dental office with her husband, Dr. Paul Perrine, whom she met in dental school and married soon after purchasing their own dental office. Both coming from small towns in West Virginia, Ripley was the perfect place for them to start their own family. Dr. Staunton truly enjoys being a dentist and serving the community of Ripley and surrounding areas. When she is out of the office, her love is spending time with her husband, baby boy, two dogs, and the rest of their family. A smile is a universal language. Never lose your smile!